Let's do it Ben, I gotta get off this continent for a while. We could do it in July. That's like Christmas for you, right?? 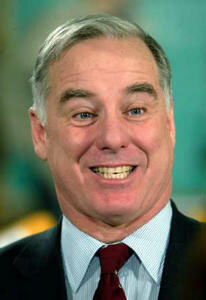 Maybe Howard Dean will come along for the ride? Let Wolf Blitzer stay here in the states. In case you didn't notice I have my S3 uploader working. Already lots of content up there in the cloud. It's a very weird namespace up there. Anyone else checking it out? BTW, I think we need to do an open-to-all S3 developers camp, in April, in Berkeley (of course). Okay, we could do it in Seattle. Neutral ground, no fee, non-exclusive, we get to ask straight tough questions. S3 could fulfill many of my dreams for the game-changers of 2006 (look closely and you'll see one of them ready to check off the list). It's a big deal, but where are the patents? I like that it has a fee structure. Will they fight cloners? There's already a Ruby implementation of the back-end. We're very close to having built-in support for the OPML Editor, and I've got a few apps designed already. Like I said, it's a big deal. Or it could be. Marc Canter wants to do an unconference at the same time as SuperNova, in SF. It's an interesting idea. A common misperception is that unconferences are unstructured. Nothing could be further from the truth. Please read the FAQ, it takes all of ten minutes, and you'll find out how different an experience it is. Each session has a discussion leader who is a benevolent dictator for 1 hour 15 minutes. The DL keeps the discussion moving, cuts off people who are repeating themselves, calls on people at the right moment. No lining up for mikes. The DL is like a reporter, and the people in the room are the sources. It can really work, but it requires everyone to be signed on to the structure. Day 2 with Amazon S3. Playing with some test apps. Vote for the World's Ugliest Dog. "I call her a canardly since you can hardly tell what she is." I'm thinking maybe about putting down roots on the west coast. Started house shopping on the net in Berkeley and the peninsula. I don't think I want to live in SF, or at least I haven't figured out yet how to shop there. One thing's for sure, I'm only interested in communities that either have easy BART service, or where the car commute to BART is relatively painless. I have to be able to get downtown with minimum fuss. In an email exchange with Richard MacManus last night I suggested perhaps we should do a BloggerCon in Australia. He passed the idea over to Ben Barren where it picked a companion BlogHer conference, which is great, speaking as a man I like conferences where there are more women than men. I wonder why! I've never been to that part of the world, so maybe now it's time to do it. Graphic: Podcasting viewed through Scripting News. There has been a lot of discussion in the last couple of days about podcasting, and whether it has achieved its promise, or if it will achieve its promise. We all have different perspectives, but if you think about what it looks like from the point of view of someone who was reading this weblog in 2001, 2002, 2003, 2004 and 2005, there was unbelievably huge growth in podcasting in 2005 and the first part of 2006. Think about all the experiments we did here in the early years, and how they didn't start getting uptake until mid-2004 or so. If one percent of the people in the US are using podcasts today, that's 3 million people. That's a lot more people than read this blog. So something is working! Last update: Friday, April 07, 2006 at 10:38 PM Eastern.